It is quite easy to check the support of the graphics card for the new DirectX 12 on Windows 10! You definitely needs an downloaded latest drivers from the manufacturer's website (NVIDIA, ATI), but in general, most graphics cards that support DirectX 11 supports also the new DirectX 12 in Windows 10. If you want to check on the Windows 10 is DirectX 12 already supported, you can find this fairly quickly. But as I said, it's a driver issue. To check the DirectX support in Windows 10! Please start the DirectX Diagnostic Tool, which is already known from the old Windows operating systems. The quickest way to start the DirectX Diagnostic Tool with the key combination [Windows Logo + R] and the command dxdiag, then simply click the Display tab Now you can use the feature layers in the group box driver see. Under the System tab, see the currently installed version of DirectX on Windows 10, it is of course the DirectX 12. (Image-1) My graphics card and DirectX 12 support on Windows 10! In this case, DirectX 11.0,10.1,10.0,9.3,9.2,9.1 supported by my NVIDIA GeForce GTX 750 Ti, but NVIDIA is a DirectX 12 driver release for the GTX series, so is the DirectX 12 on Windows 10 possible with the new driver for Windows. (Image-2) DirectX 12 on Windows 10! The solution, or statement, is not written only for Windows 10, if the sample images for testing DirectX 12 support can be recognized. You can also use this example as a solution for DirectX 12 support testing, easily and without hesitation also on other MS Windows 10 systems, regardless of whether you query DirectX 12 support on a native Windows desktop computer, or on the go and mobile on the tablet PC , Surface Pro / Go, as well as one can query as administrator on the server operating system these. 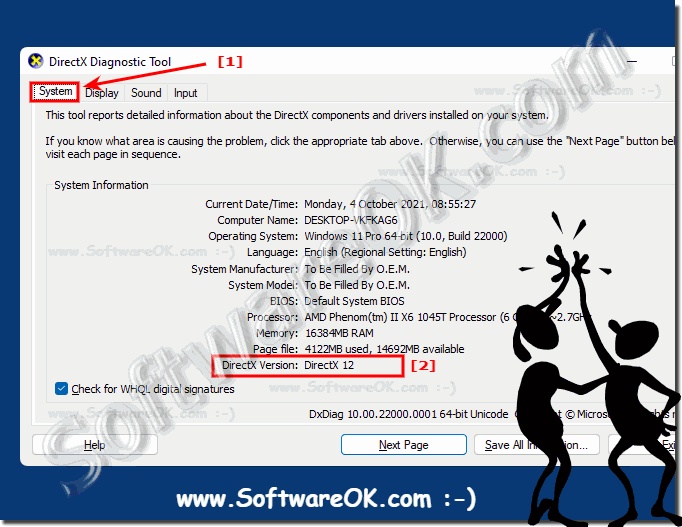 It is really useful and well to know if the DirectX 12 support is guaranteed by the graphics card. Although it is a simple solution, it is still an unknown possibility for many users to test the support. Windows-10 - FAQ-15: Supports my graphics card, the new DirectX 12 in Windows 10?